With today’s extremely competitive corporate conditions, it’s no secret that providing quality customer experience is the key to keeping customers and gaining new ones, which leads to maximizing profit. That being said, surveying your customers is the best way for your organization to predict whether the company is going in the right direction, or whether it needs to reassess its goals. The way organizations survey customers also plays a role in succeeding with building a top-notch customer experience. With the evolution of technology and the way customers needs’ change more rapidly than ever, traditional methods of conducting customer surveys such as paper forms, phone calls and emails may not be enough. OneDesk is committed to helping your organization provide the best customer experience. Therefore, we make it easy for you to understand what your customers really want, and provide ways you can capture customer feedback with less effort and get more accurate answers. Before you survey customers, follow these instructions to activate your customer portal. Send customers the link or embed it in your website. Customers can now directly submit ideas, problems, questions and compliments directly to your OneDesk account. You can run a web-based survey by creating polls for your customers to answer. Before creating polls, you must create projects. Projects allows you to group data by topic or by release. For example, you can have all your information pertaining to budget in one project, and all information about a particular release of your product in another. 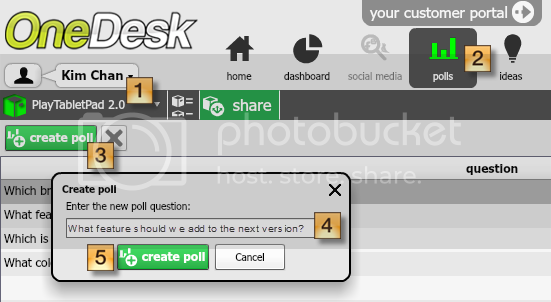 Thus, polls that you create in OneDesk will also be grouped with corresponding data. – Go to the project you wish to create the poll in(1). – Go to the Polls application (2). If you do not see the polls application, you can add it by going to project and clicking on modify. – Click Create poll (3). – Enter a poll question (4). – Create your poll (5). – At the bottom, list as many poll answer choices as you want (6). – Your answer choices will now be listed under your poll question (8). – When customers vote on your answers, you will be able to see the number of votes each answer has received (9). – Or Allow users to select multiple answers (11). – Finally, check Publish for voting (12). While considered a “traditional” method of surveying customers, email surveys can still be effective, provided they ask the right questions, have a clear call to action, and are short and clear overall. Have all the replies sent to your OneDesk email addresses. The advantage of this is that none of the replies will get lost, and you can immediately turn all the feedback you receive into actionable items. Open a community discussion with your whole customer base and ask them specific questions about the feedback they submit. Discussions allow you to obtain answer faster, and immediately clarify any uncertainties. Simply start talking to your customers under community discussions in the feedback application.